Pinto Beans are prominently featured in my 13 Week Rotating Menu Plan on 3 different weeks (as Stretchy Beans) in those 3 plus months. Pintos have been a very familiar food for me since I was a child. My mama would make a big pot of pintos every Friday night and that was our food for many meals over the weekend. I do have a sister who as a result of that doesn’t eat pintos but I still like them. In fact, I like them very much. Good thing as many beans as we eat around here! For ease of cooking and digestion ‘assistance’ we soak and/or sprout our beans. I haven’t actually sprouted pinto beans yet but hope to give that whirl. Here is a great post from KerryAnn at Cooking Traditional Foods on why she no longer soaks her beans. I think she is onto something and at some point I hope to be organized enough to copy her. For this post, I’ll share how I currently prepare pintos for our Stretchy Bean meals. My goal is to make one pot of pinto beans and then reinvent that pot into three meals to enjoy during the week. I start with 5 cups of picked over (to remove any stones or debris) and rinsed pinto beans. 5 cups is approximately 2 pounds and seems to be a good amount for my family of five providing the three meals plus leftovers for lunch. If I have leftover pintos I stick them in the freezer. I start the beans to soak in plain water the night before I want to cook them. I usually soak them in the crock pot that I plan to cook the beans in making sure I have added plenty of water. The beans need plenty of water since they will absorb it and nearly triple in volume. After my beans have soaked, I drain them and put them back in the crock pot. I like to cook my beans in homemade broth but use water if I didn’t get any broth made. I cover the pintos with broth, put the lid on and let them cook. They usually take 5 or 6 hours and then are ready to be turned into meals. I haven’t added any seasoning at this point. For my pintos I usually go ahead and lightly season the entire pot with salt, pepper and garlic. Our first Pinto Stretchy Bean meal is usually a simple plate of beans over rice with sauteed onions and greens on the side. Each person’s adds whatever additional seasonings they like to their plate. Some put ketchup on their beans or maybe salsa. I like to put a little organic sugar (not sucanat but the more processed stuff) and cider vinegar on mine. I know that sounds odd but YUM! Such a delicious and simple meal. I’ve also been experimenting with making Baked Beans out of pintos in my crock pot. The first try was good but needs a little more work. I still soaked the beans and cooked them in broth but did add ‘baked bean’ style flavorings at the start of cooking and turkey bacon. This big pot of Baked Beans also became Stretchy Beans. 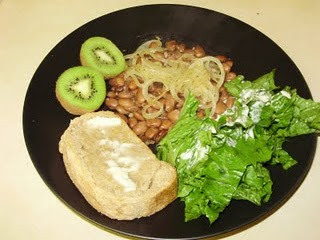 The first night we enjoyed the Baked Beans along with sauteed cabbage and brown bread. Night two was Dunkin’ Soup- a recipe from the Tightwad Gazette by Amy Dacyczyn- that was very good. Night three was also a Tightwad Gazette recipe called Corn Pone which was kind of a baked bean casserole. The baked beans provided a delicious alternative way of using the pintos. I have been re-reading the Little House books and have really enjoyed the food descriptions in the books. One that I particularly liked was Laura telling about their meals one day. Ma had started beans early in the morning. For the noon meal they had the broth that had cooked on the beans along with bread. The beans were then seasoned and put back in the oven to become baked beans for dinner. Stretchy Beans! Edited to Add: Yesterday I was making sourdough pancakes for lunch and I remembered that when I was a little girl and would visit my great grandma she would make pancakes for breakfast and put leftover pinto beans on them. I know it sounds incredibly strange but I remember it being very good. She’d also put gravy on pancakes but I don’t think I liked that as well as the pinto beans. Do you have a favorite way of using pinto beans? Have you tried sprouting pinto beans? How did they turn out? >I think the link for why the person no longer soaks her beans went to the wrong place. I love to find food descriptions in old journals and books. (Those are my favorite kind of books to read.) I actually highlight them so I can find them later. What is crazy to me is that they would eat bread and broth and be satisfied. I love bread and broth…but I like a little more substance ot my meal. But then again, that's probably why I could never fit into any piece of clothing from back then. If you don't already have the Little House cookbook, you should get it. We made apple and onions once from it. Now, I could make a meal out of that with some bacon added, bread and jam. Thanks for letting me know about the link. I fixed it. I also think the broth and bread is interesting. I hadn't heard of the Little House cookbook. Have to see if I can find it for cheap. >This post made me smile. My little girl LOVES pinto beans. Her favorite school lunch is a thermos full of beans. She gets comments from the other kids but does not seem to mind. For some reason my beans come out hard if I soak them in water (hard water?) I cook them over over night in my crock pot on the warm setting then drain and cook again. The sprouting method is something I will def try. Your list of pinto bean meals are the same as ours, good food! Christopher (age 28 months) also loves pintos. It is so funny to watch him eat them and then ask for more.